A habitat is the place or “neighborhood” where an animal lives. A suitable neighborhood must have food, water, shelter, and space in order to survive there. While each kind of animal has specific requirements for suitable types or amounts of these four things, all animals need all of them to survive. A habitat can exist in any size and can even be as small as a rock pool or a log that is decaying on the forest floor, so long as it provides the right food, water, shelter and space for that particular animal. In this fun activity, children explore the four components of habitat using deer as an example. Deer are widespread throughout the United States and can live in a variety of environments, including forests, deserts, plains, swamps, farmlands, and suburban woodlands. Wherever they live, their environment provides the food, water, shelter and space the deer need. Food: Deer are plant eaters. They will eat almost any plant or plant part. Just like us, deer need a varied diet to get all of the nutrients they need, so their habitat must contain a variety of vegetation. Water: Deer need water. Their habitat must have a water source like a stream or pond. They can also get water from snow, dew or rain that collects on plants or the ground. Shelter: Deer need protection from harsh weather and the intense sun. They use trees for shade and cover. 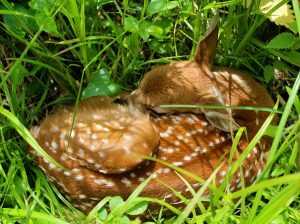 Fawns hide in the tall grasses or shrubs to keep safe from predators. Space: Deer must have plenty of space to find enough food. A typical range for a White-tailed deer is about one square mile. Start by asking children what deer and other animals need to stay alive. Ask them questions to come up with all four things. What does a deer need to keep safe? What does a deer need so that it has room to move, etc.? After identifying the four needs, ask “where might a deer find everything it needs to live?” Introduce the word habitat, a place that has all of an animal’s needs. A deer habitat should have the food, water, shelter, and space it needs to live. Head outdoors, to your playground or a local park. Have the children imagine that there is a small herd of deer living in the area. What would the deer do here? What would they eat? Is there water for them to drink? Are there places for them to hide or sleep? What you they do if it rains or snows? Have them think about how the deer act with each other. How do they tell each other things? Do they play together? Do they have families? How do they move around? As a group, pretend you are a herd of deer and the area you are in is your habitat. You can prance, stroll, and play like deer while you explore your habitat. Kindernature.org has a wide variety of activities, songs, games and crafts about both habitat and deer. Take a hike at a local natural area to find deer tracks. Follow them down the trail to find out where they are going and what they are doing in their habitat. Your county naturalist is a wealth of information and may lead the exploration! Find your county naturalist at mycountyparks.com.